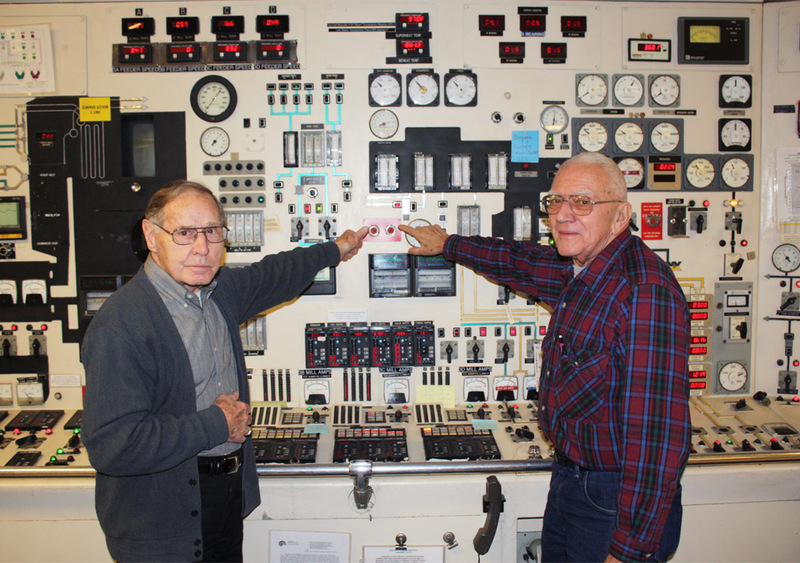 Conesville Plant retirees from Operations Eldon Williard (left) and John Matis (right) were on hand as preparations were made to trip Conesville Unit 3 off line for the final time at 4:54 p.m. December 30, 2012. Both men were involved in the start up of Unit 3 in the early 1960s. Conesville Unit 3 was a 165-megawatt coal-fired unit that began service in 1962. The AEP Ohio plant in Conesville, Ohio, continues to operate its three other units, Unit 4 (780 MW), and units 5 and 6 (375 MW each), which began service in 1973, 1976 and 1978, respectively. AEP jointly owns Unit 4 (43.5 percent ownership); other owners are DP&L and Duke.